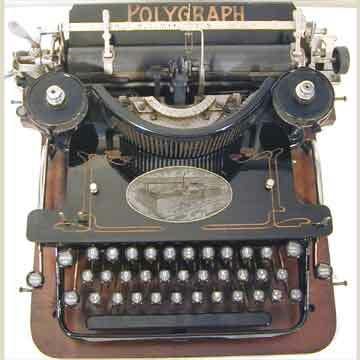 This stunning typewriter was introduced by the Polyphon-Musikwerke with a curved keyboard in 1903. The first model with the straight keyboard appeared in 1904. The machine here, the Polygraph 3 that had 2 extra keys appeared in 1906. It was a well built and beautiful machine but it was not a commercial success. The straight models 2 and 3 of the Polygraph bore a detailed decal of the production plant (see pic 6).